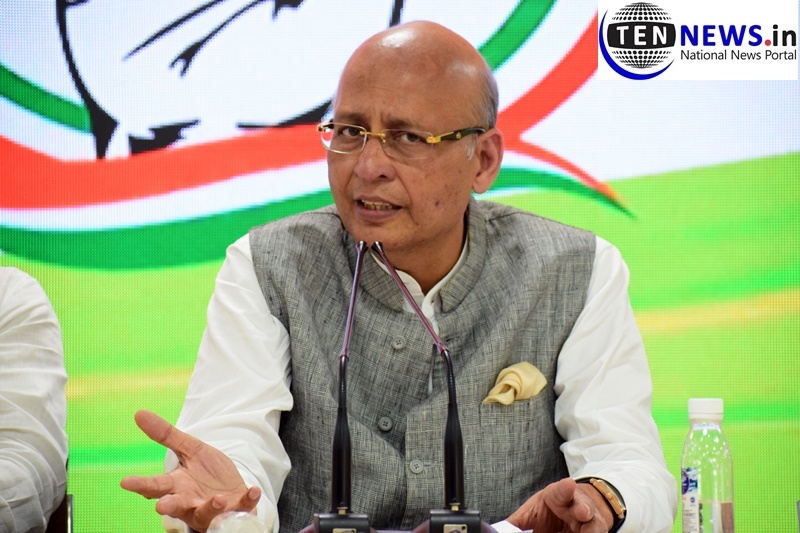 New Delhi : At a media briefing today, senior Congress leader Abhishek Manu Singhvi accused the BJP of holding “distortion campaign”. “Be rest assured that the distortion campaign by the BJP will be done away with… The ‘right to distortion’ is being brought above basic fundamental structure (by the BJP). We’ll give our explanation (on Rahul’s remarks) to Supreme Court,” he said. On the other hand, BJP leader Ravi Shankar Prasad said at a press conference that the Election Commission should take cognisance of Congress president’s Rahul Gandhi’s “chowkidar chor hai” remark against Prime Minister Narendra Modi . “When will Rahul Gandhi stop this shameless showering of abuses on our leader,” said Prasad. Singhvi at the conference focused on the speech delivered by Yogi Adityanath in which he used ‘Ali’ and ‘Bajrang Bali’ as Brahmastr. Earlier today, the Delhi CEO has written to the Election Commission drawing its attention to a web series on Prime Minister Narendra Modi, which went online earlier this month and is being aired without permission from the Media Certification and Monitoring Committee (MCMC), officials said.